Heidi is the name of orphaned white rhino that lived in Thula Thula, private reserve in South Africa. Despite living in a reserve, she was poached. I read a book called ‘The Last Rhinos’ by Lawrence Anthony. He died suddenly in 2012. Main subject in this book is about saving last of wild Northern white rhinos, which wasn’t successful. Heidi is in this book. I didn’t physically modelled on the Heidi, I just named my rhino after her, because I was so moved by the book. 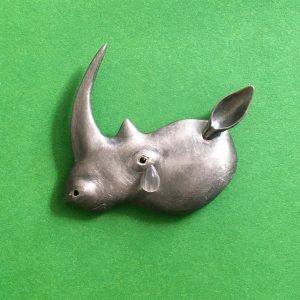 I tried to represent all rhino species in my rhino sculpture, although it looks more like African species. I also tried to express characters and situation of rhinos that they are second heaviest land mammal and heaviest that can jump, and also they are timid and vulnerable. There are five species of rhinoceroses living today, two of these, Sumatran and Javan Rhino numbers are extremely low and both species are listed as critically endangered. With Sumatran Rhino, efforts are now being invested in captive breeding. With Javan Rhino, Only a single population in Ujung Kulon National Park exists. Local conservationists, supported by Save the Rhino, are working hard to increase the habitat for this species since it is believed that the current habitat cannot support any more rhinos, and Rhino Protection Units have been set up to monitor and protect both the remaining Javan and Sumatran rhinos.